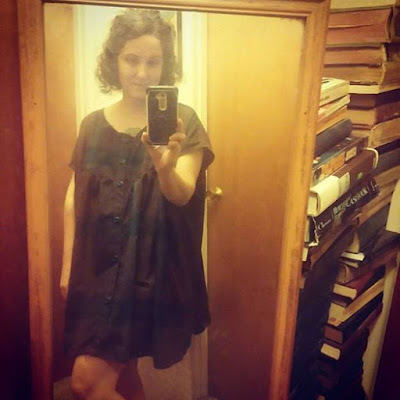 irregular tidbits of sewing, knitting, thrifting, & wardrobe curation. The beginning of the academic year always brings a bit of chaos to my world & this year doubly... because I got a new job assignment right after my previous blog and I've been putting every ounce of brain power into learning new things and getting stuff done at work... then coming home and collapsing. As the students and the rain and the darkess return, historically I lose my "sewjo" or whatever you call that certain cocktail of inspiration, motivation, raw materials, time, and energy necessary to make garments happen. This year, as fall encroached and the pace ramped up at work, I felt the sewjo draining away - I completed several promised projects for church and that was all for the months of August and September... but I finally started to get a little equilibrium and a big longing for some self-care of the creative variety this October. It happens to be another internet sewing phenomenon month #slowfashionoctober and that's pretty cool... but I haven't had the energy to follow along much... however, I did read a great blog on Make Do & Mend today. Speaking of mending, I've been doing a lot of mending lately, myself. I can't knit any more - I tried it for one weekend in September when I was sick and really wanted to have a cozy craft and my Dequervains flared up immediately. So I'm giving all my yarn away. Anyhow, I used to like to knit while watching my favorite tv shows as a way to unwind when work has me stressed and tired... the knitting is soothing and interesting, but also it makes me feel like the binge watching is a productive indulgence. With knitting out the picture, I turned to my mending pile for handwork that I could do while watching shows... it's been great. I did a bunch of maintenance on my sweaters for fall, fixed some stuff for my husband, took care of wear and tear on a few of my favorite me-mades. Very satisfying. It wasn't until the first weekend in October that I got to do a little self-indulgent machine sewing just for my own fashion pleasure. I wasn't really happy with this skirt. Something was just off. I had reworked the fit of the waistband a couple times but I wasn't thrilled with the plain white waistband and I never found a top that seemed to match/harmonize with the skirt. So when the zipper broke, rather than remaking the skirt, I decided to make it into a dress. With the scraps I had left from 2 yards of the Michael Miller Growl fabric, I just barely eked out a sleeveless bodice from a pattern hack I drafted from the Pauline Alice Cami shirt dress. Above is my first version of Cami that I never blogged about - I didn't like the instructions for the collar, so I cut it off after I made it -but I did love the shape of the bodice. When I thought of a bodice to add this skirt on, I turned to a pattern hack I had crafted but never cut as plain front, no buttons. 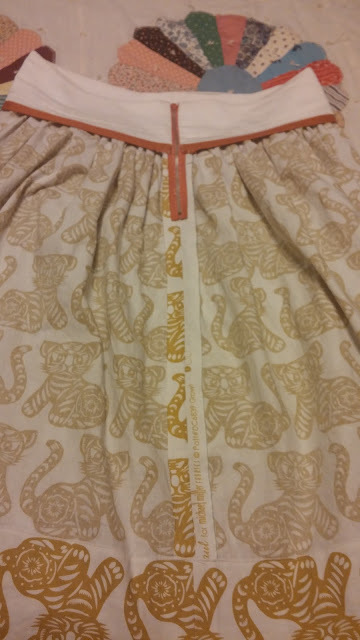 The side zip closure on Cami also worked well with existing tiger skirt because it was a side-zip too... so it didn't require a lot of remaking. I love it so much as a dress! Also, I love the Cami bodice for my short waist and I am still working on little adjustments to make it the basic dress block that Emery never came to be. I may add a dart in the arm hole in the future - but I am very pleased with the potential of this pattern for future dresses. I finished Growl 2.0 the first weekend of October and it was the last really warm early fall weather we had, so I got to wear it as a summer dress once before the rains set in. I've also since worn it to work with tights and a cotton cardigan and I got a ton of compliments from strangers around campus - including several very fashionably-dressed students. So the moral of this projects is, when you fear there are too many tigers on your garment, the solution is not to dial it down with plain white fabric - it's to go all-out and add *more* tigers! Okay, with summer sewing finished, I now venture into new territory for me... fall/winter sewing. I lost my "sewjo" or the time/will to sew for myself at the start of the academic year in 2014 and haven't really sewn a lot of winter-appropriate me-mades in my spring and summer sewing. I have, though, been collecting thrifted fabrics that I imagined becoming fall/winter garments. So, the second weekend of October, I spent my time cutting some fall stuff. I'm obsessed with plaid. I've been wanting some plaid babydoll dresses for ages - ever since making my first me-made New Look 6305. I finally did it! I totally love this dress! It's so dorky and comfy... I just feel like a million bucks wearing it with a slouchy cardigan and some chunky oxfords. My other finished object is also an oversized plaid babydoll dress, but not a tried-and-true pattern. I thought it might be fun to try something different with this wearable muslin experimental pattern. I wore it out on a lovely autumn walk with my husband today too - it layers up really well. For some reason, this dress reminds me of the movie Ghost World. Who knows?! Also - both these oversized plaid dresses look cute with a turtleneck layered underneath & could go with knee socks or legwarmers layered over the tights too, for more warmth as winter settles in. The pattern was a weird spur-of-the-moment idea. When I was thrifting last weekend, I found a pristine McCalls M6605 Tunic pattern in a size that would be too big for me to wear as intended, but I thought, with a few tweaks, the tunic length might make a good dress pattern. For 99 cents, I thought it was worth a try. I made some guesses in adjusting the pattern for this muslin and dove in. I didn't take care to match the plaid or anything - but I'm still pleased with the finished muslin. I think it still needs a few refinements... but overall, I like the direction it's heading and this version will certainly get worn for kicking around in this fall/winter. To give the sort of dumpy fabric and quick construction a boost, I used really fun vintage buttons on it. I always mentally dread button holes, but once I get started, I rather enjoy making them & my re-tuned Viking 6460 is reliably kicking out a nice tight, even button hole now - so it's less of a big deal than ever before. Let's forget zips and do lots more buttons this fall! Next up, to polish off what I already have cut - a 10 oz maroon denim Brumby. I bought the denim this summer to try to make jeans... but I've really been wanting a burgundy skirt, so I just decided to stash-bust and make something I know I will get a lot of good use out of, instead of letting it languish in my stash waiting for the wild moment when I decide to make jeans. I'm embracing using things from my stash but also not beating myself up for adding to my stash when I am inspired to, which has mostly been my thrifting lately. I haven't bought any new fabric since July. The plaids I used in these projects were all thrifted finds that I've been saving for the last two years. In my mind, after saving them for a long time - they became special... but they are actually both kind of crappy older synthetic fabrics. Which actually gives them a perfect 1990s grunge throwback feeling that matches the garments they became just perfectly. I'm working with what I have in my stash for winter - working my way toward making some lined wool skirts. I'm not going to let winter stop me this year. I'm feeling really curious and looking forward to bringing me-made sewn garments into all 4 seasons this year.